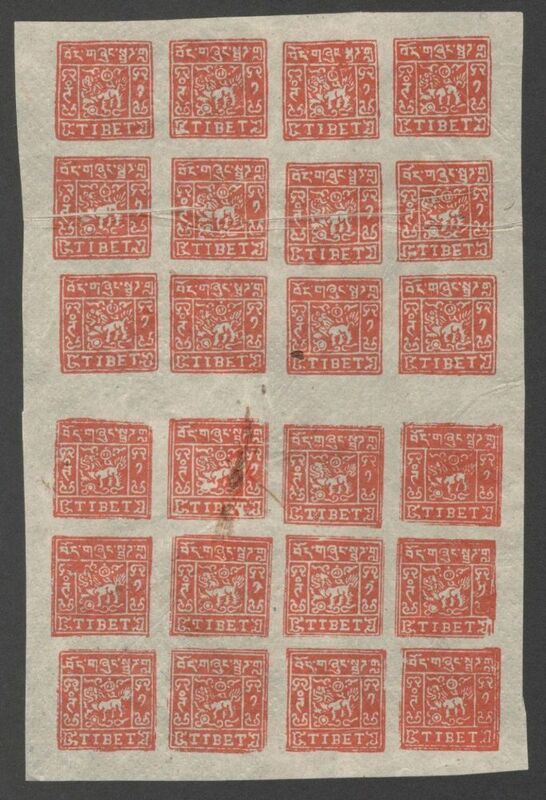 Quote Reply Topic: Tibet 1 Trangka issue 1933 setting4 forgery? Stumbled upon this on ebay and took the "chance". Now i am pretty sure it is a forgery. It looks like two prints on the same sheet of a setting 4 from the 1933 1 Triangka issue. Could not find any mentioning of such two prints on one sheet. What looks like dirt is inside the very thin paper. Condition is perfect. PS: Awesome collection and documentation, Rainer! Great site and forum. I love it! These sheets of 24 are unfinished remainders of the so-called Dahnke reprints. Kurt Dahnke had them prepared and added one sheet of 24 to his handbook. However, the ones "issued" by Kurt Dahnke were back coated in white colour and the reprint of the genuine sheet has small black dots on front. The upper sheet of 12 is the reprint of a genuine sheet, the bottom one is the reprint of a forgery sheet. After Dahnke has passed away these remainders where given by his widow to a Nuremberg dealer (Oleg Rabjujek) from where I could purchased the largest part, some sheets however already wet into wrong hands. Along with the reprints i also purchased the printing matrices to have them away from the market and they are in my home. Thank you so much for the details! Awesome expertise. The sheet will go into my collection of fakes. I hope, i learned my lesson.